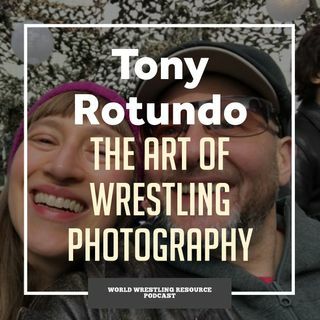 Episode 65 talks with one of the world's top wrestling photographers, Tony Rotundo of www.WrestlersAreWarriors.com. A native New Yorker who did a little bit of international wrestling in his youth, Rotundo has become one of the most versatile shooters in the world. Rotundo has covered a number of World Championships and the 2016 Olympic Games and his shots have graced the covers of nearly every major wrestling magazine and website over the past decade. Rotundo talks about the feel of ... Más informaciones international wrestling, covering events abroad, how he got into photography and what it was like to land a coveted Olympic credential. For a full breakdown of the images we talk about in this episode, go to www.mattalkonline.com/tonyphotos. Follow Tony on Twitter at www.twitter.com/tony_rotundo. The World Wrestling Resource has a slew of resources for wrestlers and coaches from all levels and information about the products can be found at www.worldwrestlingresource.com. Do you have a question or a topic you'd like to hear the World Wrestling Resource staff discuss? Drop us a comment on Facebook at www.facebook.com/worldwrestlingresource or on twitter at @WWRESO. The World Wrestling Resource is sponsored by DefenseSoap. The World Wrestling Resource Podcast is a presentation of the Mat Talk Podcast Network. And if you're a fan of the extensive and broad-based reach of the shows on the Mat Talk Podcast Network, become a TEAM MEMBER today at www.patreon.com/mattalkonline. There are various levels of perks for the different levels of team membership. If you like wrestling content -- scratch that -- if you LOVE great wrestling content, consider becoming a team member. You'll get some cool stuff too.